Tyson Fury vs Denis Boystov is off in case you haven’t heard. The fight, scheduled for December 1st, was cancelled after Boystov pulled out, giving the legendary excuse that he wouldn’t be fit enough to “contest such a duel”. A lot of people will use this as evidence to fuel their opinion that Fury is ducking the higher level fighters in the heavyweight division, but I don’t think anyone can say this is Tyson Fury or Mick Hennessey’s fault. 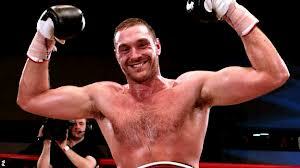 This isn’t the first time a boxer has cancelled a bout with Fury. Ruslan Chagaev was the first name Hennessey went for to get a decent match for his fight, but Chagaev refused the bout because he felt he needed more time to prepare for a fight with Fury. This was a disappointment itself because a fight with Chagaev would have been a great test for the unbeaten heavyweight. Team Fury will now be looking for a last minute replacement so that they can fulfil their December date. I think this man will be Tony Grano. The reason I think this is because before the Fury vs Boystov fight was made Hennessey had already asked Grano if he would be available to fight in Ireland on the date they had in mind. He was always going to be the back-up plan for team Fury. Grano is ranked fifth in the WBC list, putting him just one place below Tyson Fury. Boystov is ranked third, so Grano is not as good a fight to make but you take get what you can get. Don’t worry though, Tyson Fury vs Denis Boystov will be rescheduled for early 2013 because it is the second of two semi-final eliminators for the Vitali Klitschko’s WBC world title belt. The other semi-final is Chris Arreola vs Bermane Stiverne. I know what you’re thinking at this point; after watching Kell Brook fight in a million title eliminators, you’re thinking that the eliminator bouts set up by governing bodies are meaningless. I agree. Be the first to tell your friends about Fury's fight!